We were forewarned by Scott Goodall that our Chemin de la Liberté guide Paul Dubons had recce’d our usual route over the Pyrenees and found the last pass over the frontier into Catalunya blocked with snow and ice and too dangerous to attempt to cross. Nor would we be able to reach the Halifax crash site. For the second year running good ole global warming had dumped an unseasonable amount of snow on the Pyrenees to thwart our plans. We would have to climb back down from the Estagnous refuge after the third day and go by bus to Esterri d’Aneau, our final destination. This was huge disappointment for newcomers to Le Chemin, but did not dampen their spirits. 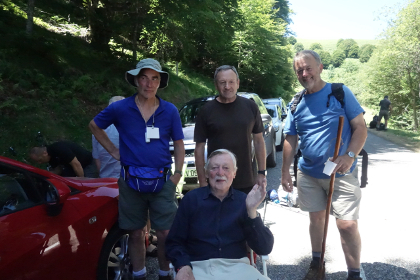 Nor those of the usual ELMS Chemin crowd who turned up for the event – Bernard Holvoet, Brid Ni Fhinnagain, Edgar Aromin, Helen Duffee, Jeremy Pearcy, Ray Milford, Charles Wilson, among others. Before we set off, we were entertained by the Chemin de la Liberté Association with a reception at the informative Chemin Museum in the old St Girons Railway station and at a formal ceremony at the site of the old German command post at Kercabanac on the road to Seix. 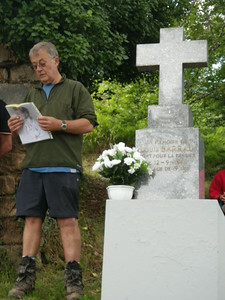 The first day was trying ten hours hard walking though the densely wooded foothills of the Pyrenees, broken by the welcome picnic lunch put on by the Barrau family in honour of Louis Barrau who was gunned down by a German patrol at a shepherds’ hut nearby, where a moving ceremony took place. Personally I have definitely decided to call the Chemin a day. Ten since 2003 is enough. With my left knee swelling (damaged in 2006 crossing the Creten White Mountains from the Med to the Libyan Sea) it became difficult to put pressure on it to haul myself up the face of the wretched 8,500′ Mt Valier, with the result that I fell way behind on the third day. It was also pouring with rain, bloody cold with visibility about 50m. Moreover along with others, I had not slept well the night before where we camped just below the snow line. Temperatures dropped to around 4C. Incessant rain hammered into my tent and water “ponded” on the ground sheet by my feet. My sleeping bag soaked up the water like blotting paper and I awoke around 0300 to find myself drenched in freezing water from the waist down. I was already fully clothed in a vain attempt to keep warm. Scrambling down the cliff from the crest of Mt Valier to the refuge at Estagnous was almost as bad. I took a couple of tumbles in the snow but hurt no more than my pride. Even though I put myself straight to bed inside the refuge dorm on arrival, I was shivering for ages with hypothermia. All this in July – no wonder so many perished at other times of the year trying to escape for real. It’s taken me 10 Pyreneen crossings over 12 years to work out that it is not really a good idea to increase your weight by 20% and upset your balance carrying a 15kg rucksack, then rush up a cold, slippery, icy 8,500′ mountain where the oxygen level is beginning to tail off…News from my insurance company, that they are not renewing my all-risks, world-wide policy in October because I would be 70 next year, also played a part in my decision. For the second year running we again suffered the disappointment of not being able to cross the frontier at the Col de la Claoeure into Catalunya because of excessive snow and ice. However, when we finished the 5 hour walk-out down from Estagnous we were bussed via Vielha around to Esterri d’Aneu for a suburb reception with lots of food and a dancing display by Le Chemin Association members in full Pyreneen costume – you could not buy such an experience. 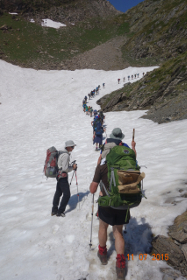 Unfortunately the arrangements made with the Catalan Government and the local Mayors of Esterri and Sort for 100 local walkers to meet us for a ceremony at the 8500′ frontier Col de la Claoeure fell through because of the foul weather, and sadly none turned up at the reception. On the other hand, several big plusses included the presence of George & Janet Duffee – thanks to Helen and Keith’s logistical efforts. 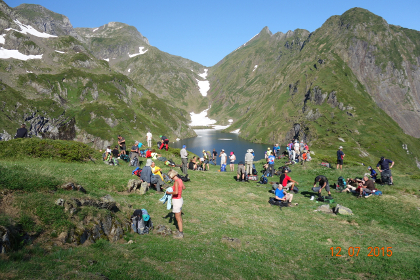 The twenty second edition of Le Chemin de la Liberté was brimming with potential, as the first opportunity to complete the traditional four-day crossing of the Pyrenees in three years was within reach. As ever, a widely ranging ensemble attended; with representatives of the Royal British Legion, NATO and MSF flanking a fine medley of repeat climbers along with eager first-timers for this memorable journey. Significant by their absence however, for the first time in the twenty two years of this commemoration, was that of international WWII veterans. 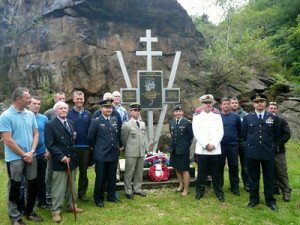 Their role in events seventy years ago was prominent in our thoughts during the walk and the ceremonies throughout. 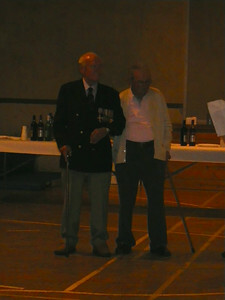 The presence of their French comrade, Paul Broué, offered a poignant reminder of the strength, integrity and sacrifices made. The succeeding generations were well represented, with a significant number of father/son and father/daughter ensembles, including Paul Broué’s grandson, and ages ranging from a young French lady in her teens to a septuagenarian Englishman completing the group. More than two dozen ladies of various nations also attended, keeping step with the gentlemen in their midst. 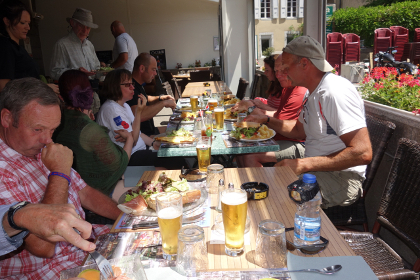 Scott and Judy Goodall, in their time honoured way, kept nerves at bay and spirits high upon our arrival in St. Girons. 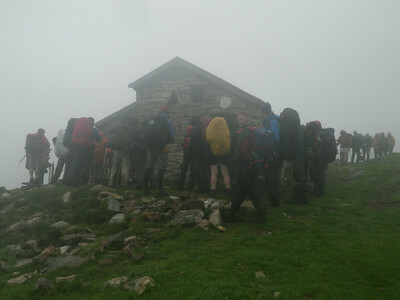 A blissful Thursday morning bade us ‘Bon Courage’, offering the best possible start to the walkers. That afternoon and Friday saw the temperatures escalate, adding to the challenge of the young, the old, the brave and the bold assembled. Not surprisingly however, the hospitality was as warm as the weather. On the land of the Barreau family, la Mairie of Seix and at Subéra, we were guests of a multinational celebration of friendship, food, drink, singing and dancing – even a birthday or two! Such high spirits a reflection of the memory of the giants in whose footsteps we followed. The climb to Halifax on Saturday – the first in three years – was bathed in mist and cloud, adding to the solemnity of the occasion. The cloud slowly cleared for the morning ceremony, as our thoughts were with the souls of the seven young men who lost their lives so long ago. A long, hot afternoon awaited us, casting a burdensome toll on the intrepid walkers, with the climate compounding the physical exertion felt by all. Sunday morning saw a determined start, with a slow and steady passing by the vast majority over the border into Spain. 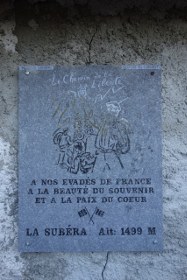 This year’s Chemin gifted the walkers the bittersweet privilege of scattering the ashes of Dot Collins, wife of the late Maurice Collins, who were both dedicated supporters of Le Chemin de la Liberté since its inauguration, following Maurice’s successful crossing during the war. Having never forgotten the courage and sacrifice of those who assisted him, Maurice’s own ashes were scattered at the border in 2006. A poignant ceremony saw the wind gently carry Dot’s remains to join those of Maurice, and the memory of so many more. Paul Debon and his team of encadrements led us to Esterri d’Aneu, which greeted us with cold showers and cold beer – both warmly welcome! – as we were serenaded and heralded through the streets. A fine feed, glorious singing of traditional songs and impressive attempts at local dancing (considering the exertions!) saw us ready for the long bus journey to St. Girons. No Chemin is without its challenges, and this year was no exception. Two significant medical events befell this intrepid group, which were handled in a calm, controlled manner notable in the circumstances of the pre-existing exertions, and a credit to those involved. We wish both individuals a speedy recovery. As a blistering sun sets on the twenty second edition, we find ourselves looking forward to 2016. As the years pass, and fewer veterans are present to remind us, we must strive ourselves to remember; to tell of the liberté, égalité and fraternité that has been demonstrated to us in darker times. Far braver people, in far worse conditions, with no kit have done this … at night, in snow, in fear for their lives and in hope of a better future. We will remember them.